Mrs. E's family met the The Mazzetta Crew at Alice Keck Park this past weekend to do some family photo taking swapping. Got that? :) Each of us has one child under 3, which equals a child who is fairly difficult to photograph. They have to be in the mood and you have to shake a rattle, scream their name, and make sure their bellies are full to even have a chance that they will look at the camera and give a hint of a smile. Challenging, you bet! Here is the real reason for this post. For over a year now J and I have been struggling to learn Adobe Photoshop and how to use it to alter our photos to make them better. Little did we know that you can download "actions." An action is basically the lazy man's way to learn Photoshop AND it is awesome. I am using Pioneer Woman's actions found here. She also has a much better definition of an action. Photo 1: The one I took. 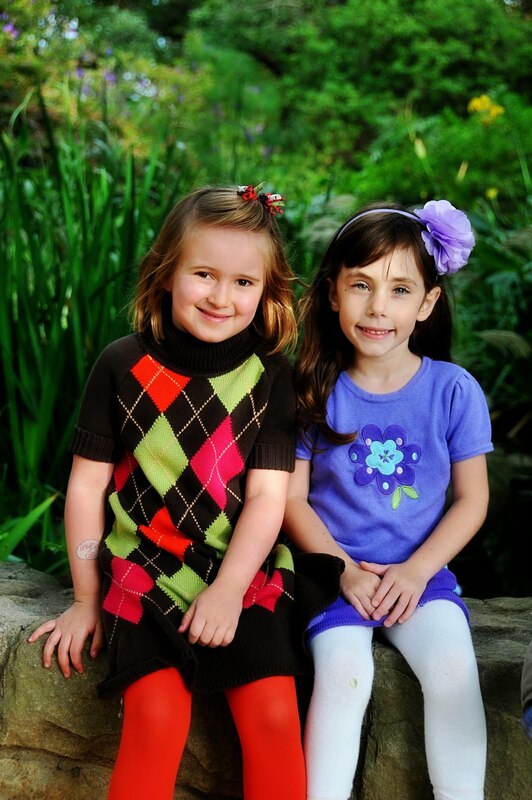 A good photo of two adorable girlies, but it does need a little oomph! Photo 2: I ran the Boost Action and...darn if I wasn't playing around so much that I have no idea what I did. Good times!